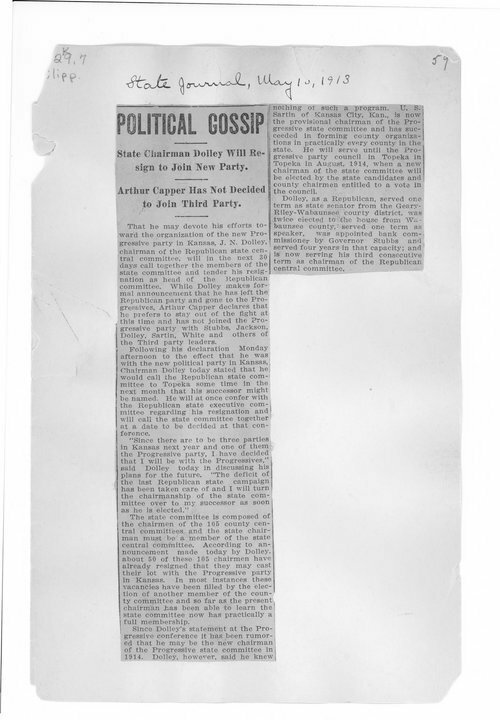 A newspaper article published in the Topeka State Journal, May 1913, reports that Joseph N. Dolley, chairman of the Republican Party, would switch parties and join the Progressives. Dolley, as a Republican, served one term as State Senator from the Geary/Riley/Wasbaunsee county district and two terms in the Kansas House from Wabaunsee county, served one term as speaker. He was appointed bank commissioner by Governor Stubbs. Dolley served three consecutive terms as chairman of the Republican Central Committee. Dolley was credited with encouraging the Kansas Legislature to pass the blue sky law in 1911. Kansas was the first state to enact the blue sky law, which protected investors from securities frauds. It served as a model for similar statutes in other states.